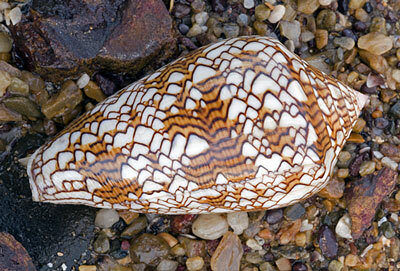 The Textile Cone shell has an irregular shingle-like pattern. It feeds on other molluscs which it immobilises by injecting a powerful venom with a harpoon-like tooth. The strength of this venom varies according to the type of prey the cone targets. Fish eaters have the strongest venom whereas those that eat worms do not need the same toxicity. Growing to 10 cm, the Textile Cone is highly dangerous to humans and should not be handled whatsoever. It is found in tropical waters of the Indo-west Pacific.